After the 2013 shutdown, most people assumed the Congress would never go there again. Why would they? By some estimates, the last shutdown wasted $24 billion. Just to put that in perspective, the median family income in the U.S. is about $55,000. The amount the last shutdown wasted was roughly equal to the total household income for 436,000 families. Even more shocking is that it wasted the income taxes paid by about 4 million households. A shutdown directly affects almost the entire federal workforce. Even employees who are in an excepted position cannot be paid during a shutdown. 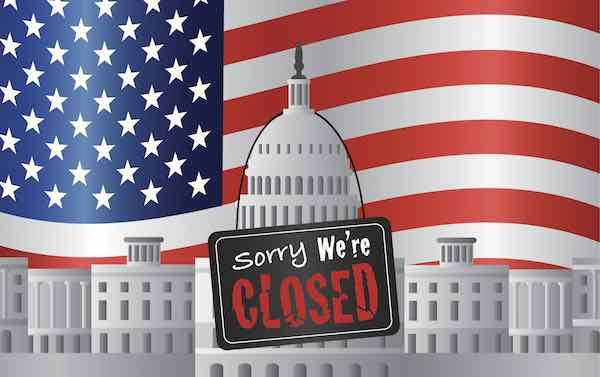 There are three categories of employees for shutdown purposes – Exempt, Excepted and Furloughed. Exempt employees are paid by appropriations that do not have to be passed by Congress every year or by fees or working capital funds. They work during the a lapse of appropriations because their money is still there. They also continue to get paid for the same reason. There is a possibility that the money would run out. For example, if an agency relies on fees paid by other agencies from appropriated dollars, the money can dry up quickly during a shutdown. In that case, the employees would shift to the other two categories. Excepted employees (not the same as the excepted service) work because they are engaged in activities that cannot be allowed to stop. The Border Patrol is a good example. If we took the Border Patrol offline during a shutdown, the number of undocumented border crossings would skyrocket. People who want to do us harm would see an ideal opportunity to get their people into the U.S. Even though there is no money available to pay them, the work of the Border Patrol is so critical to our safety that they will continue to work. It is important to remember the exception covers their work and not their leave. If an excepted employee wants to take leave, s/he must be furloughed for that time. The legal justification is solid – we can make an exception to protect the border, save a life, engage in diplomacy, or many other excepted functions, but we cannot make an exception to go on vacation. The key point to remember is there is no way to pay excepted employees until the shutdown is over. Furloughed employees were sent home without pay. There is no money available to pay for their work, and their work does not have the urgency that work such as the Border Patrol has. They are still subject to all of the restrictions and requirements that covered them when they were working. That means they cannot get outside employment without approval, cannot take gifts from contractors or other sources, etc. They are subject to a rapid recall, so they cannot treat the furlough time like a vacation and go away. Agencies have to plan for potential shutdowns and the planning has both a dollar cost and an opportunity cost. Time that is wasted on planning for another shutdown is gone forever, but no responsible agency can fail to plan for the consequences. They have the choice of being wasteful or irresponsible. Businesses have to earn revenue to pay employees. If they are told to stop work, the company’s revenue for that contract stops. Larger firms can absorb the impact for a few days, but not much longer. Small firms may not be able to absorb anything. If they lose the revenue, they have to immediately lay off employees. The government does not make the contractor whole after the shutdown and the employer does not make the employee whole. Everyone suffers and no one wins. Walk into a restaurant near federal offices or military installations and take look at the number of federal employees who are there. Go to the dry cleaners, the convenience stores, and the coffee shops. They depend heavily on customers who work for the federal government, either as employees or contractors. When they are not at work, those businesses send employees home. They get no revenue and their employees get no pay. No one makes any of them whole. The tight profit margins in businesses such as fast food restaurants mean a prolonged shutdown could make the difference in profit and loss for the year. It halted permitting and environmental and other reviews, delaying job-creating transportation and energy projects. For example, the Bureau of Land Management (BLM) was unable to process about 200 Applications for Permit to Drill, delaying energy development on federal lands in North Dakota, Wyoming, Utah, and other states. It hindered trade by putting import and export licenses and applications on hold. For example, because the Treasury Department’s Alcohol and Tobacco Tax and Trade Bureau was unable to issue export certificates for beer, wine, and distilled spirits, more than two million liters of U.S. products were left sitting at ports unable to ship. It disrupted private-sector lending to individuals and small businesses. During the shutdown, banks and other lenders could not access government income and Social Security Number verification services. Two weeks into the shutdown, the Internal Revenue Service (IRS) had an inventory of 1.2 million verification requests that could not be processed, potentially delaying approv- al of mortgages and other loans. It halted Federal loans to small businesses, homeowners, and housing and health care facility developers. The Small Business Administration (SBA) was unable to process about 700 applications for $140 million in small business loans, and the Federal Housing Administration (FHA) was unable to process over 500 applications for loans to develop, rehabilitate, or refinance around 80,000 multifamily rental units. It delayed the Alaskan crab fishing season, costing fisherman thousands of dollars in lost revenue. Because the National Oceanic and Atmospheric Administration (NOAA) was unable to apportion harvest levels, the start of the season was delayed for three to four days. The fishing industry estimates these delays cost fisherman thousands of dollars of lost revenue per day, since days lost at the beginning of the season cannot be made up later. It disrupted tourism and travel by closing national parks and the Smithsonian. The National Park Service (NPS) estimates that the shutdown led to over $500 million in lost visitor spending nationwide, a significant economic hit to communities surrounding national parks and monuments. It significantly impacted small businesses that contract with the federal government. Compared with the same period last year, small business contracts with the Department of Defense (DOD) dropped by almost one-third during the shutdown, and spending dropped 40 percent. It delayed aircraft purchases and deliveries by closing the Federal Aviation Administration (FAA)’s Aircraft Registry. The General Aviation Manufacturers Association estimates that this delayed 156 aircraft deliveries valued at $1.9 billion. It temporarily closed six Head Start grantees, serving nearly 6,300 children. Head start grantees operating in Alabama, Connecticut, Florida, Georgia, Mississippi, and South Carolina closed for up to nine days before reopening with funds provided by philanthropists through the National Head Start Association or their state. So – in addition to burning the government’s borrowed money, a shutdown will harm businesses large and small, take money out of the pockets of working men and women, reduce tax revenues, disrupt communities, and generally make a mess. Taking an optimistic view of the situation, I believe it is not likely that the congress and president will let a shutdown happen. Taxpayers (and voters) saw the consequences of the last shutdown, and the people on the Hill and in the White House have to realize that there is no way any of them win if the government shuts down. So – federal employees should prepare for the possibility, but should not be getting stressed out any more than they might already be. Reason should prevail. I hope.